Little House on the Prairie represents an enduring appeal of simpler times and a hardy, pioneering spirit that millions have come to know and love. That’s why we are so thrilled to announce a new line of rustic furniture by Dundalk LeisureCraft based on the timelessness embodied in Laura Ingalls Wilder’s stories of love, home, family, joy, optimism, and perseverance. To celebrate, we are offering two pieces from the collection as part of this exciting giveaway valued at over $1,000. Start by logging into rafflecopter via Facebook or by using your email address on the screen below. Earn additional entries and points when you click on the other fields and follow the instructions. * The Little House on the Prairie™ Giveaway ends November 30, 2016 at 11:59 pm Pacific Time. Values are based on Suggested Retail Prices. Open to U.S. Residents in the 48 contiguous states only, 18 years and over. Void where prohibited by law. This is a beautiful bedroom set! I love the rustic look! It would be so amazing to win this!! I’m working on a Little House on the Prairie quilt right now! It’d be so dreamy to put it on this bed!!!! What a beautiful set. Thank you for making it available. I like the style of your new line. I do Little House programs every year for the kiddos during our Pioneer Days in town. L.I. W. will always be the best children’s author! Great looking style and craftsmanship. 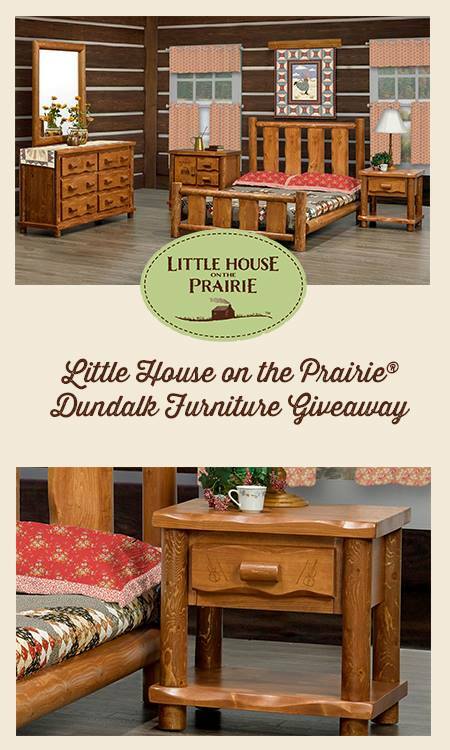 Hope I win the Dundalk furniture for my guest room. Got plenty of quilts to go on it! What a great give-away! I have always loved Little House on the prairie. I own the book set and also have visited the homestead in Mansfield, MO. It would be exciting to win this! Beautiful furniture! What a great opportunity to own a piece of art! Hope I win this I can’t find anything else to get for my mom for Christmas. I’ve entered everyday!!!! I AM SO IN LOVE WITH THIS RUSTIC FURNITURE! beautiful bedroom set i love it and so would my mom.